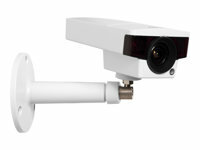 Axis Comapanion Camera Companion is a basic surveillance system, ideal for small stores and offices. Video is recorded in the cameras, which makes the system easy to install and manage, even for the casual user. Images optimised for forensic analysis Supporting WDR - Forensic Capture capability, the video is highly optimised for forensic purposes and provides extreme levels of detail – even in scenes with very complex light conditions. Thanks to the automatic IR-cut filter, AXIS M1124 can deliver images both day and night. Furthermore, the network camera includes the ability to seamlessly transition between WDR and low-light mode. AXIS M1124 incorporates Axis’ Zipstream technology, which is a radically more efficient H.264 implementation, lowering bandwidth and storage requirements by an average 50% or more for many common 24/7 surveillance use cases. 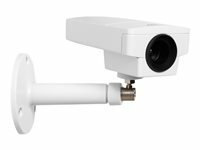 Outdoor-ready video surveillance The outdoor-ready camera provides IP66- and NEMA 4X-rated as well as IK10-rated protection. The camera can withstand a temperatures range of -20 °C to 50°C (-4 °F to 122 °F). Axis Comapanion Camera Companion is a basic surveillance system, ideal for small stores and offices. Video is recorded in the cameras, which makes the system easy to install and manage, even for the casual user. Images optimised for forensic analysis Supporting WDR - Forensic Capture capability, the video is highly optimised for forensic purposes and provides extreme levels of detail – even in scenes with very complex light conditions. Thanks to the automatic IR-cut filter, AXIS M1124-E can deliver images both day and night. Furthermore, the network camera includes the ability to seamlessly transition between WDR and low-light mode. Axis Comapanion Camera Companion is a basic surveillance system, ideal for small stores and offices. Video is recorded in the cameras, which makes the system easy to install and manage, even for the casual user. Images optimised for forensic analysis Supporting WDR - Forensic Capture capability, the video is highly optimised for forensic purposes and provides extreme levels of detail – even in scenes with very complex light conditions. Thanks to the automatic IR-cut filter, AXIS M1125 can deliver images both day and night. Furthermore, the network camera includes the ability to seamlessly transition between WDR and low-light mode. 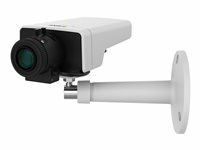 Outdoor-ready video surveillance The outdoor-ready camera provides IP66- and NEMA 4X-rated as well as IK10-rated protection. The camera can withstand a temperatures range of -20 °C to 50°C (-4 °F to 122 °F). Axis Comapanion Camera Companion is a basic surveillance system, ideal for small stores and offices. Video is recorded in the cameras, which makes the system easy to install and manage, even for the casual user. Images optimised for forensic analysis Supporting WDR - Forensic Capture capability, the video is highly optimised for forensic purposes and provides extreme levels of detail – even in scenes with very complex light conditions. Thanks to the automatic IR-cut filter, AXIS M1125-E can deliver images both day and night. Furthermore, the network camera includes the ability to seamlessly transition between WDR and low-light mode. Excellent image quality AXIS M1145 with board-mount, varifocal, P-iris lens provides excellent image quality at 30 frames per second in 2 megapixel/HDTV resolution. The P-iris control provides optimal depth of field, resolution, image contrast and clarity. The cost-effective, compactly designed camera offers multiple H.264 and Motion JPEG streams that can be individually optimized for bandwidth and storage efficiency. The camera supports digital pan/tilt/zoom, which allows a view cropped from the full view to be streamed for viewing or recording. Edge storage for reliable surveillance systems AXIS M1145 offers support for edge storage that allows recording video directly to a storage such as an microSD/SD/SDHC card, thereby creating a flexible and reliable video surveillance system. Ease of installation Power over Ethernet supplies power to the camera via the network, eliminating the need for power cables and reducing installation costs. AXIS M1145 also offers remote zoom and focus that eliminates the need for hands-on fine tuning and ensures that the camera's angle of view is optimized for the area to be monitored. I/O ports The input/output port can be used for simple notification to an alarm panel or control of a relay or similar. The input is also ideal, for instance, when using a PIR sensor. Axis Comapanion Camera Companion is a basic surveillance system, ideal for small stores and offices. Video is recorded in the cameras, which makes the system easy to install and manage, even for the casual user. Images optimised for forensic analysis Supporting WDR - Forensic Capture capability, the video is highly optimised for forensic purposes and provides extreme levels of detail – even in scenes with very complex light conditions. Thanks to the automatic IR-cut filter, AXIS M1145 can deliver images both day and night. Furthermore, the network camera includes the ability to seamlessly transition between WDR and low-light mode. AXIS M1145 incorporates Axis’ Zipstream technology, which is a radically more efficient H.264 implementation, lowering bandwidth and storage requirements by an average 50% or more for many common 24/7 surveillance use cases. 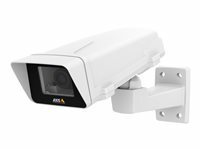 Excellent image quality AXIS M1145-L with board-mount, varifocal, P-iris lens provides excellent image quality at 30 frames per second in 2 megapixel/HDTV resolution. The P-iris control provides optimal depth of field, resolution, image contrast and clarity. The cost-effective, compactly designed camera offers multiple H.264 and Motion JPEG streams that can be individually optimised for bandwidth and storage efficiency. The camera supports digital pan/tilt/zoom, which allows a view cropped from the full view to be streamed for viewing or recording. Built-in IR-LEDs with OptimizedIR AXIS M1145-L offers Axis OptimizedIR, a power-efficient LED technology that provides an adaptable angle of IR illumination and discreet integration of IR LEDs, the cameras provide automatic illumination of a scene in complete darkness, at an event or when requested by a user. Edge storage for reliable surveillance systems AXIS M1145-L offers support for edge storage that allows recording video directly to a storage such as a microSD/SD/SDHC card, thereby creating a flexible and reliable video surveillance system. Ease of installation Power over Ethernet supplies power to the camera via the network, eliminating the need for power cables and reducing installation costs. AXIS M1145-Lalso offers remote zoom and focus that eliminates the need for hands-on fine tuning and ensures that the camera's angle of view is optimised for the area to be monitored. Axis Comapanion Camera Companion is a basic surveillance system, ideal for small stores and offices. Video is recorded in the cameras, which makes the system easy to install and manage, even for the casual user. Images optimised for forensic analysis Supporting WDR - Forensic Capture capability, the video is highly optimised for forensic purposes and provides extreme levels of detail – even in scenes with very complex light conditions. Thanks to the automatic IR-cut filter, AXIS M1145L can deliver images both day and night. Furthermore, the network camera includes the ability to seamlessly transition between WDR and low-light mode. AXIS M1145-L incorporates Axis’ Zipstream technology, which is a radically more efficient H.264 implementation, lowering bandwidth and storage requirements by an average 50% or more for many common 24/7 surveillance use cases.